The Gilded Age, Mark Twain’s ironic term for the American counterpart to the Belle Epoque, was silver-plated for a few but a tarnished period in history for everyone else. The administration of Ulysses S. Grant was plagued by a series of financial scandals, including the Gold Conspiracy, the Whiskey Ring, the Salary Grab, and the notorious Crédit Mobilier affair, in which U.S. Congressmen traded favors for stock in a sleazy railroad construction scheme. The nation’s monetary policy, likewise, served as an arena of vitriolic combat between advocates of the gold standard and proponents of bimetallism—in which silver as well as gold was used to back paper currency. With the repeal of the Sherman Silver Purchase Act in 1893, the silver market collapsed, and its investors were ruined. Silver, as much as gold, was a glittery metaphor for the opulence of the Gilded Age, during which California served as a focal point of fevered speculation. The Gold Rush of 1849 was followed a decade later by the discovery of silver ore deep within the Comstock Lode in Virginia City, Nevada. This vast fissure vein, the largest strike of precious metal ever found on American soil, produced several bonanzas before becoming depleted in the late 1870s and made millionaires of individuals like James G. (“Slippery Jim”) Fair, James C. Flood, John W. Mackay, and William S. O’Brien, an Irishtocracy of self-made men who controlled the mines. The Comstock was so called after Henry Comstock, a prospector who talked his way into partial ownership of the Ophir mine. He sold his claim for the paltry sum of $11,000, however, before the Ophir revealed the true depth of its riches, and Comstock died stone-broke. This pattern of rags to riches and back to rags was repeated manifold times as demand for silver stock drove prices higher, only to fall, leaving its investors disillusioned and cash poor. The seemingly inexhaustible supply of silver ore generated by the Comstock Lode made San Francisco an instant center of silver-making, on par with Boston, New York, and Philadelphia. The city’s silver-makers readily incorporated specifically California motifs like the bear, miners’ cabins, gold pans, and the stagecoach into their designs. 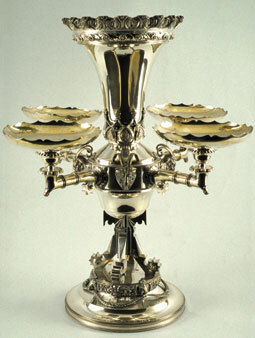 They produced tableware and household items, objects for personal use, medals, prize cups, and dinner invitations to historic events, and their wares were exhibited at fairs and industrial arts exhibitions. Despite high demand and the proliferation of their work, little is known about most of the silversmiths themselves, as most records were destroyed in the 1906 earthquake. The Ore to Opulence exhibit explored the history of the Comstock Lode, as well as provided biographical sketches of the four silver kings, James G. Fair, James C. Flood, John W. Mackay, and William S. O’Brien. It ran from June 19, 2003 to October 3, 2003 in the Seymour Pioneer Museum.